I knew I was getting old, when, a few years ago, I seemed to conclude on a regular basis that something was just not the way it used to be. For awhile, I could see only the down side of this state of affairs, but, thanks to the wisdom bestowed upon me by other LTH-ers, I have now come to a new understanding. The upside of most things no longer being the way they used to be is that a few things do stay the same as they always were, and that makes them all the more rare and beautiful. 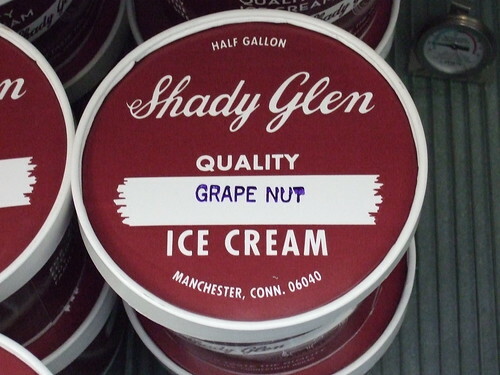 A case in point: Shady Glen Dairy Stores in Manchester, CT. Exterior of original location. The photos below were taken in the “new” location, on the west side of town. 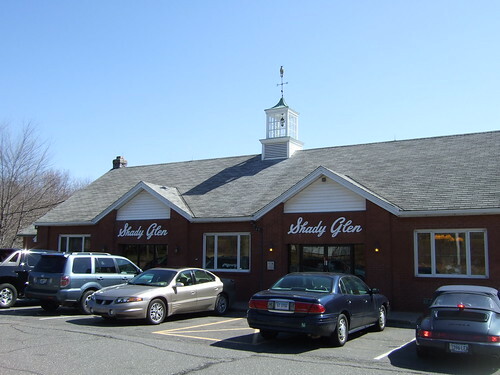 Shady Glen is justifiably proud of 60 years in business. 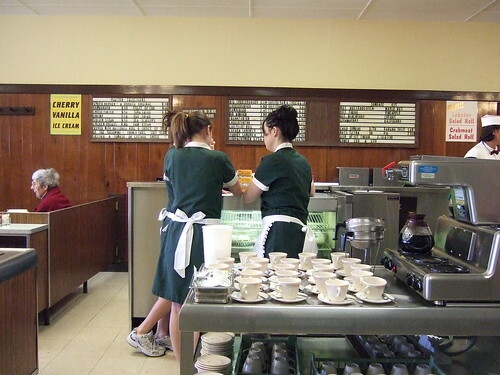 These young waitresses seemed to get a real kick out of wearing the vintage white cuffed and collared uniforms and starched aprons. And how about that coffee set-up? Crispy cheese burgers are the big draw at Shady Glen. (I can't help thinking of The Flying Nun for some reason). The cheese is good old American, and your guess is as good as mine as to how they keep it intact over the burger patty. The place has been touted by Roadfood.com and the Sterns. I heard about it from some of my young co-workers, who grew up nearby. The cole slaw is house-made and quite good. 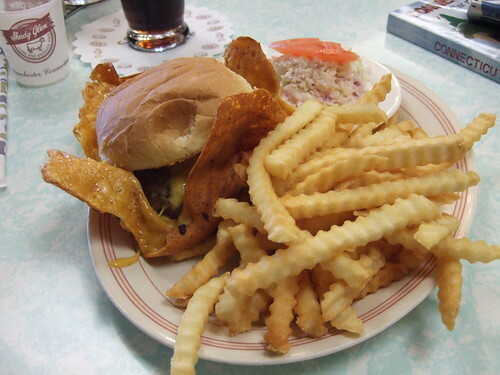 Fries were average, but onion rings well-done seem to be the way to go, based on my co-workers' recommendations. Here, the fellow at the grill demonstrates his adaptation of bowtie to polo shirt and the standard Shady Glen fried cheese technique. You can order a side or two of fried cheese if you are into that sort of thing. 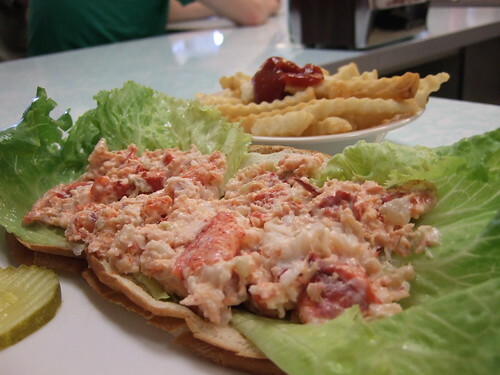 This being Connecticut, a lobster roll is available. While not the very best I have ever had, this was a fresh and generous version, quite satisfying. 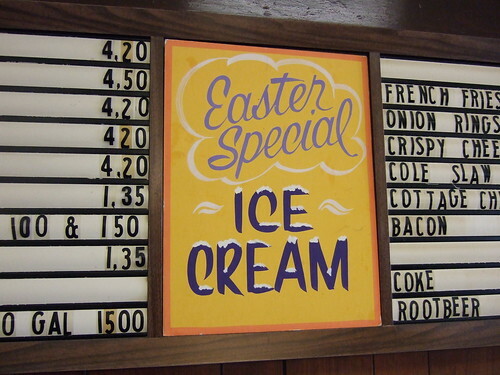 Although I admit to a traditional bent regarding hot fudge sundaes, my nostalgia jones was well-enough soothed by Shady Glen to permit me a foray into novelty: Easter Special Ice Cream. It was an almond scented green base studded with pineapple and maraschino cherries. Good, but next time I think I will opt for the Hot Blueberry sundae. What charming photos, and text too. 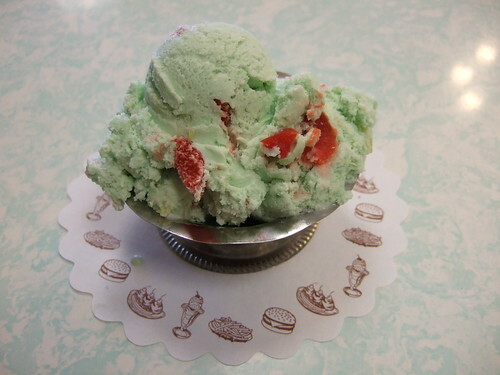 I feel like going to Margie's and having just okay ice cream with a triple scoop of Americana (well, Greco-Americana). It's nice to see you posting from your new (temporary) home. 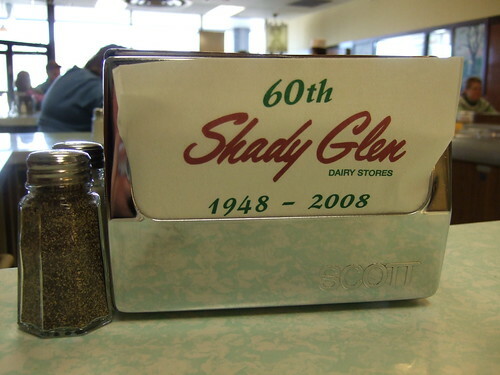 I'll bet there are a bunch of places of the same ilk as Shady Glen. I can't wait t hear about them! Thank you for posting this. The wife and I will have to make a point to stop by next time we venture up from the coast to visit her parents. Have you visited 'A little taste of Texas' in Manchester? It's not Honey 1, but easily the best ribs I've found in this wasteland of Culinary options. You can get your choice of pork spares, beef or bison ribs. The wife was a fan of the pulled pork, and the Mac n'cheese was definitely spiked with a nice sharp cheddar. Thanks for the kind words, Mike and Steve. I am finding that my LTH forum-honed skills are proving a substantial measure of comfort for stranger in a strange land. Spotted today: a down-at-heel diner featuring "American and Canadian Cooking." French Canadiens make up a substantial minority here in New England, so I am interested to learn more about this place. Can you say "Poutine?" Flip-- I am not aware of the BBQ house you mentioned-- I live near "Little Mark's Big BBQ." where my last experience was "meh." So I will report on the bison ribs and sharp Mac 'n Cheese sometime soon! Thanks for the heads up. I will reciprocate by posting on New London soon! This report reminds me of Barbara Fritchie Restaurant from the building style, waitress outfits and Americana menu. I am looking forward to the Canadian-American diner experience report someday. Josephine wrote: Funny you should mention the building style, Cathy. From something I saw recently on the Food Channel, this is the same style popularized by Howard Johnson-- without the orange roof and turquoise accents. 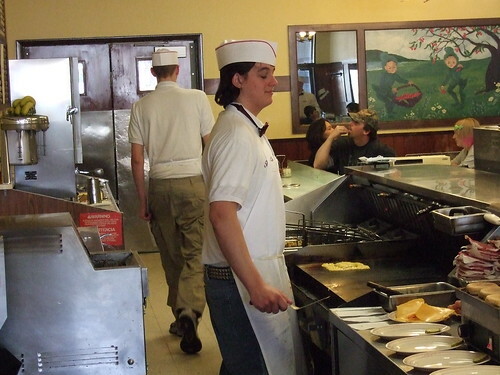 Soon, I will post on my favorite local chain, Friendly's, which also has the same building style seen here. You can add the now closed chain Bill Knapp's to the list of places built in that same style. Forgive my ignorance, where was Bill Knapp's? Josephine wrote: Forgive my ignorance, where was Bill Knapp's? All over Michigan and Northern Indiana, as I recall. Not sure where else they covered. My family regularly ate there on trips to visit our relatives in Michigan in the 70s. I've been to Shady Glen. I really wanted to like it, as I love that kind of roadside dining spot, but ultimately the service did the place in for me. When we got there, we saw people waiting in line in at two different areas of the place, it was completely hectic with no one seemingly knowing what to do about who to sit first. Once we got a table, they messed up our order a couple of times. The food was mostly very good, but it wasn't the most pleasant dining experience. I was at Woodman's in Buffalo Grove looking through their bakery section. I saw they offered 'Old-Fashioned Pumpkin Dunkers' from Bill Knapps. These were pretty good with a thick cinnamon-sugar coating. They were effectively donuts, though shaped oblong without any hole. From a little reading, I should keep an eye out for their Chocolate cake, too.